Why are thousands of Chicago's Chinese buried out in Stickney? At Mount Auburn Cemetery in Stickney, visitors can burn gifts for their dead ancestors at this altar created for the purpose. For nearly a century Chicago’s Chinese have been making spring pilgrimages to southwest suburban Stickney. It’s not for the food — in fact they usually bring their own. And it’s not for their culture — the suburb is historically Bohemian. But there are more than 8,000 other reasons to visit: the graves of their ancestors that reside way in the back of Mount Auburn Memorial Park. On a recent early spring morning, Vivian and Kevin Mei were there with three generations of their family. And they were having a picnic on their grandfather’s grave. 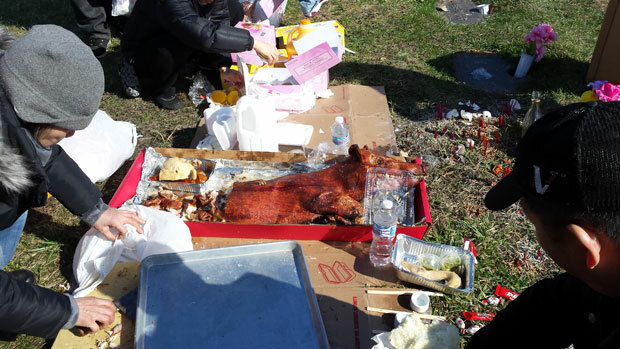 “We brought a whole roasted pork, some of our granddad’s favorite shrimp dumplings, we brought bread, we brought beverages, chicken and duck,” Mei said while an uncle took a cleaver to the pig. “You bring what they liked to eat when they were alive,” Kevin added. Sharing foods that ancestors loved is an important part of this annual tradition called Qing Ming. Families are also encouraged to visit on special dates in the fall to make sure dead relatives are well-prepared for the cold days ahead. During these times each year, thousands of Chicagoans like the Meis flock to Mount Auburn carrying plastic bags and bakery boxes bulging with pastries, pork buns and meat. Long rows of cars snake down the narrow road leading back to the Chinese section where an altar provides a safe place for burning paper money and gifts for the dead. Jim Yong was carrying bags heavy with food when he arrived with his wife and small children. Yong’s been trekking to this blue collar suburb since he was a kid, but like a lot of visitors, he was never quite sure why this location was chosen. There are a lot of family stories like that, trying to make sense of why people who lived in the city — one with plenty of cemeteries — would make Stickney their final resting place. Source after source suggested asking the Chinese Consolidated Benevolent Association in Chinatown. After all, this social service agency has been setting up Chinese burials at Mount Auburn for almost 100 years. But the CCBA wasn’t all that helpful. In fact, they said they couldn’t find any original documents related to those early years. Still, one official who calls himself “GK” offered a couple of theories. But 91-year-old Eunice Wong thinks there’s a more sinister angle. She’s the daughter of the late, powerful Chicago businessman Tom Chan Sr. Chan’s first wife was buried at Rosehill Cemetery on the North Side around 1920. But when it came time to bury Chan himself in 1944, “They refused to have him buried,” she said. Indeed, stories from the Chicago Daily Tribune in 1944 pretty much confirm Wong’s version of Caucasian-only policy and her father’s exclusion. But they also indicate Rosehill’s main objection was the Chinese practice of digging up bones and sending them back to China. Back then, many Chinese believed a person’s final resting place should be in his native soil. Rosehill’s management told the Tribune in 1944 its other clients were freaked out by “the scenes and the stench." Wong’s family, however, didn’t want to dig up any bones. They were here to stay, so they couldn’t understand the exclusion. In recent years the Chinese community has been welcomed back to Rosehill, which came under new ownership in 1991. Still, the majority have stuck with Stickney — Jim Yong among them. On the windy Qing Ming weekend, his kids were cheerfully spreading rainbow-colored towels on their great-grandparents graves, as their dad explained the day. For now, Qing Ming traditions remain strong at Mount Auburn. On certain spring weekends it can feel like many of the Chicago area’s 100,000 Chinese (many foreign-born) are throwing a big family reunion in a single spot. Many have even started to schedule their visits before or after the holiday to avoid the crowds. But, it’s unclear just how long the younger generations will keep up the practice. Twenty-something barista Kevin Mei says he’s not even sure which days he’s supposed to visit. So how does he know when to go?